Authenticity is an important trait, and zebrafish take it especially seriously. 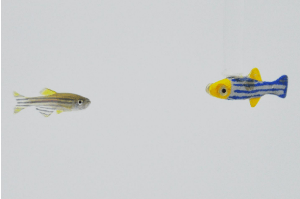 An interdisciplinary team of researchers at the NYU Tandon School of Engineering discovered that zebrafish engage more with 3D-moving robotic models of themselves than with other stimuli. The team, headed by Maurizio Porfiri, professor of Mechanical and Aerospace Engineering, devised the controllable, customizable robotic platform to help researchers more accurately study freshwater fish behavior. Like a puppet master, the robotic platform maneuvers biologically inspired 3D-printed replicas to mimic the swimming patterns of real fish. Zebrafish are highly versatile and increasingly taking the place of more complex animals in behavioral studies. Understanding their social behavior may help researchers explore mechanisms behind human disorders like anxiety, addiction, autism, and schizophrenia. For this test, Porfiri and his team introduced the live zebrafish in the middle section of a three-compartment experimental tank with the robotic fish and an empty section on either side. The researchers contrasted the response of live fish to the 3D-moving replica, a 2D-moving replica, a static replica, a transparent replica, and a non-moving rod. Their findings showed that fish were attracted to a robot that mimicked both the appearance and the motion of real fish, and this attraction was lost when either differed. The research team includes NYU Tandon researchers Tommaso Ruberto and Daniele Neri, doctoral student Violet Mwaffo, and undergraduate student Sukhgewanpreet Singh. The National Science Foundation and the Mitsui USA Foundation supported the research. “Zebrafish Response to a Robotic Replica in Three Dimensions,” appeared in Royal Society Open Science and is available at rsos.royalsocietypublishing.org/content/3/10/160505.